Whether you’re making or adjusting oboe reeds, the Westwind reed knife and sharpening system improves your control and makes it easier to define your own personal version of the perfect reed. Why buy a Westwind reed knife? Learning to control a reed knife is no small feat. Experienced reed makers will tell you that it took them years to master the art of using — and sharpening — their traditional reed knives. At Westwind, we believe that learning to control a reed knife shouldn’t be so hard. That's why we've developed a new approach, offering both traditional and tapered blade designs that work in combination with a sharpening system inspired by the best tools used in the woodworking trade. The Westwind standard reed knife uses a traditional design for the knife blade. It combines the best features of both hollow ground and beveled knife styles. The hollow grind in the front face of the blade minimizes the blade's contact with the sharpening stone. The back face, by contrast, is a shallow bevel. The Westwind tapered reed knife is a scraping tool by design, which means it makes short work of long scrapes at the back of the reed while allowing delicate and refined control at the tip. The tapered configuration works naturally with the forces of your hand, letting you scrape from back to front with minimal pressure. And because the tip of the blade makes a smaller arc and pivots closer to your hand than traditional reed knives, you’ll find that it increases your control dramatically. Like our standard reed knife, the tapered knife combines the best features of both hollow ground and beveled knife styles, and is designed to work easily with the Westwind sharpening system. For some people — and especially novices — knife sharpening is a matter of considerable difficulty. A momentary error in holding a precise angle while sharpening a blade can destroy a good edge. That means students often choose to work with a dull blade rather than risking uncertain results. 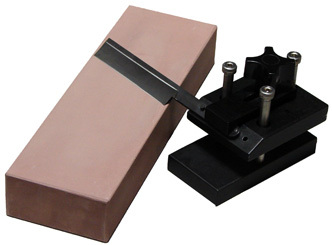 To solve this problem, the Westwind sharpening system provides a specialized fixture that holds the blade firmly in place at the correct angle with respect to the sharpening stone. That means you can sharpen and re-sharpen your Westwind reed knife as many times as you like without fear of damage.